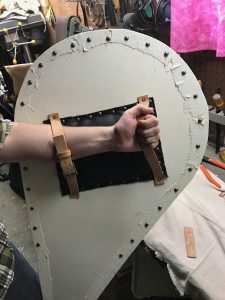 The full-size shields are constructed by hand, using (2x)plywood with a fabric covering painted over with multilayered white, and also feature leather arm padding and adjustable strapping. 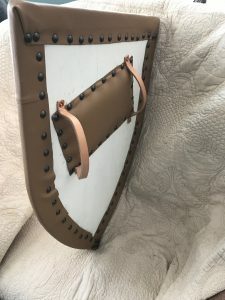 The wee shields are similar in most respects, except a single straight sheet of thicker plywood base is typically used, and leather strapping is of a simpler, non-adjustable design. 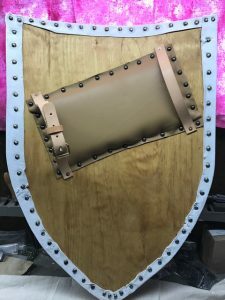 My shields are not mass produced, and therefore will likely not be free from some imperfections, e.g. 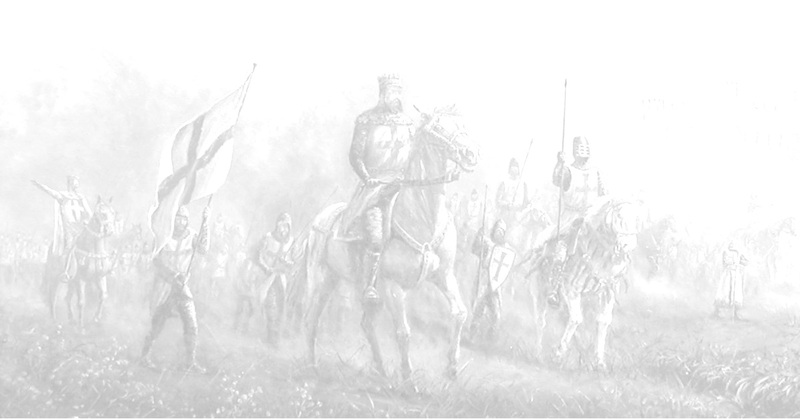 they might not be accurate to laser-level specs. 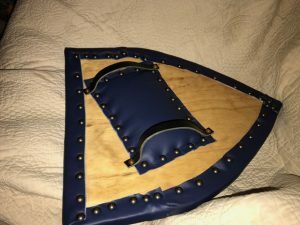 I believe this lends itself to the shields possessing a somewhat personal, down to earth quality. 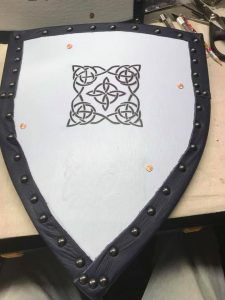 I strive to craft these shields to be pleasing to the eye, and able to be utilized as weapons of (simulated)war, though they are not made of metal, and as such, the amount of ‘wear and tear’ your shield will endure, will certainly vary from person to person, and use to use. 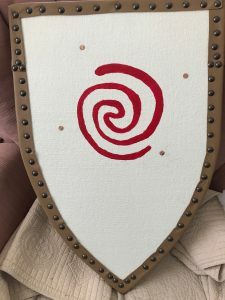 This is a smaller shield, suitable for a child, styled in the ‘Heater’ fashion. 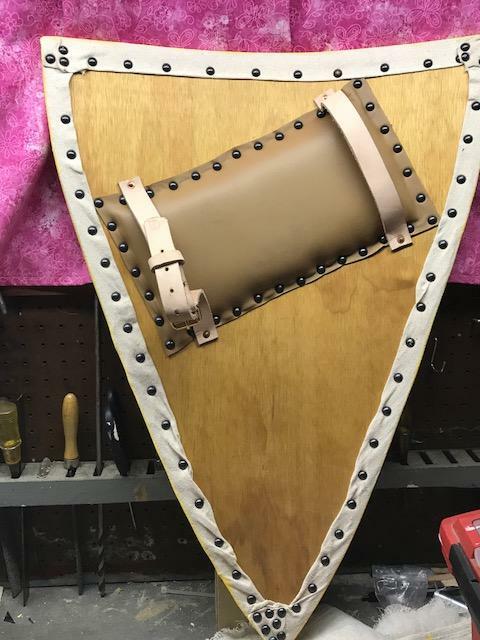 It is constructed from a 1/2″ plywood piece, sanded, and covered in fabric. 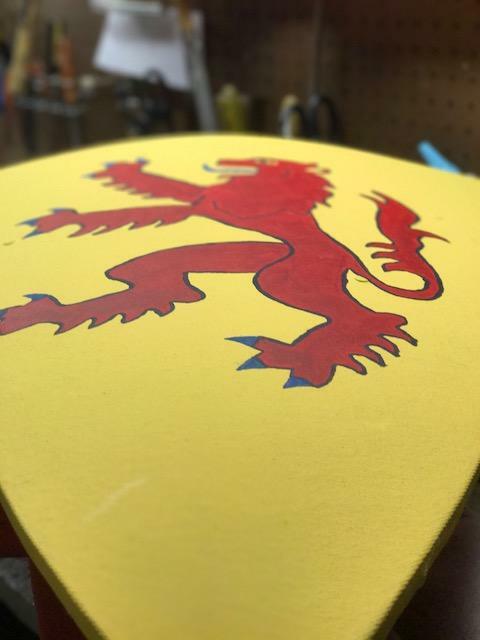 It features the same quality hand tacking that the big shields have. 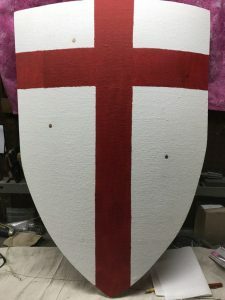 There is a selection of painted designs available, and as with the large shields, any custom artwork can be discussed.